Red Bud Industries, Red Bud, IL, has introduced a scrap chopper featuring a dual helical design using a scissor-type cutting action. This allows the chopper, according to company officials, to operate more quietly than other models with a more controlled and smooth cutting action. The rotary scrap choppers will only be offered on full Red Bud lines. The chopper’s knives are attached to a set of rotating drums, driven by an electronic drive. With this design, the rotation of the drums/knives is precisely maintained to create a smooth, scissor-like action to cut the scrap material. This not only reduces sound levels but also minimizes wear and tear on the machine. Each knife features four edges that can be used before the knives must be sharpened. To remove the knives, an operator need only remove one bolt; a locating pin simplifies reinstalling the knives. The dual helical scrap choppers are available on Red Bud slitting lines, multiblanking systems and cut-to-length lines with edge-trim systems. 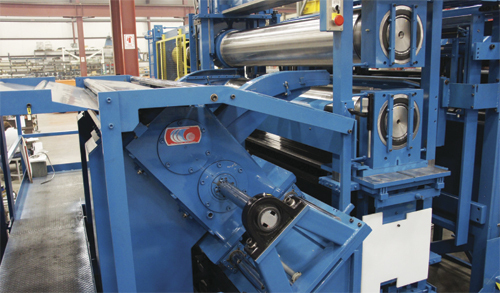 We have Slitting line which will run at 200 MPM, sheet thickness varies from .5 to 2.5 mm. three sides trims sheet will come out, for this we are looking for Scrap chopper, when I gone through your web I found some equipment. right now we are using scrap winder, due to its speed its difficult to handle.